The mental health bed has been specifically designed to meet the requirements of mental health institutions. It has a strong steel frame and welds that have been tested to safely support a rated load of 250kg. The lift actuator and electrical components are inset located and protected under the mattress base giving the bed a clean appearance. The bed surface is a flat sheet with no backrest or knee bend options. The slim line head & footboards are not removable once installed. All critical moving joints are fitted with bronze bearings for quiet operation and long life. The height range of the bed is 240 – 740mm. The bed is operated with an infra-red control and, for safety reasons, the power lead is removable, leaving no leads available to the patient. The bed has a smooth powder coated finish, giving a durable surface and safe, clean appearance to the bed. 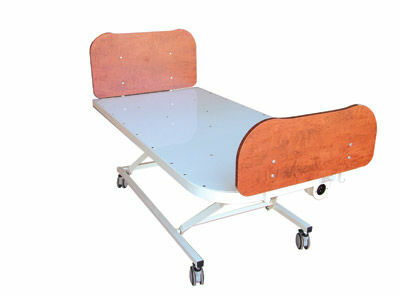 This bed has been tested for over 2000 cycles with its rated load. Other testing has been carried out in accordance with Australian Standards to ensure that the bed is safe, reliable and meets the requirements of the TGA.